MORE than 80 Cubs and Scouts from around Bognor Regis have been presented with prestigious awards. The young people were presented with badges and certificates for achieving their silver and bronze Chief Scout Awards. The presentations were carried out by Bognor Regis town mayor, Cllr Stephen Reynolds, and West Sussex Scouts youth commissioner, Michael Priest. The occasion at St Mary’s Church hall in Felpham was attended by 220 proud parents and friends of the award winners. The bronze Chief Scout Award is the top award for Beaver Scouts, the youngest members of Scouting, and the silver award is the top award for Cub Scouts. Jan Poupart, the assistant district commissioner for Cubs with Bognor Regis and District Scouts, said: “The young people have shown that they are adventurous, attempting and succeeding in a variety of activities, ranging from archery and abseiling to camping and climbing and sailing and swimming. “Much of it involved giving help in the community and learning about the world around them. 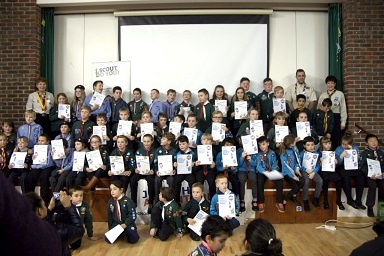 The successful Cubs and Scouts are pictured at the ceremony with their respective awards.